Ground source heat pumps convert energy found in the ground and convert it into usable heat for our homes and businesses. Ground source heat pumps run off electricity but output over 5 times the energy they require to run. As a result, customers making the switch will significantly reduce their running costs. Ground source heat pumps harvest residual heat energy from the ground and converts it into usable heat for our space heating and hot water provision. Ground source units harvest low-grade heat from the ground through pipes situated either in ground loops or a borehole. A mixture of water and antifreeze circulates the pipes and absorbs heat. From here, the heat pump compresses the fluid upgrading its temperature before distributing it to space heating and hot water systems. From here, cooled fluid is sent back to the ground to start again. This process will continue for as long as there’s heating demand. The size of space available and the heat demand of the property usually dictates whether a ground loop or a borehole is the most suitable type of heat collector. Loops in the ground, either flat or coiled, offer the most cost-effective solution. However, customers with space concerns might be forced to consider drilling down into the ground for a borehole. Ground source heat pumps are extremely efficient, capable of outputting between 4 and 5 times they energy they consume. It’s because of this that a ground source installation yields some of the largest energy savings. 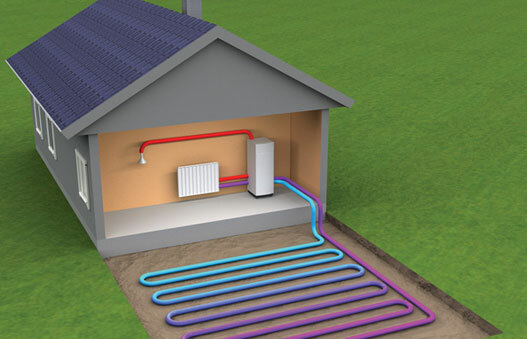 A typical ground source system can save customers as much as 50% on their annual heating bills. Furthermore, with the cost of traditional heating fuels continuously rising and a 20-year design life on most ground source units, switching to renewable heating provides security from unstable energy prices. Customers installing ground source heat pumps through an MCS accredited installer will be able to access the Renewable Heat Incentive scheme. The Renewable Heat Incentive, or RHI for short, is a government-led scheme that provides financial incentive to customers switching their heating demand to a renewable alternative. The scheme aims to neutralise the difference in costs between renewable and non-renewable solutions. In effect, the RHI pays customers for each unit of renewable heat their system generates. Payments vary depending on the efficiency of the system installed, the efficiency of the benefiting property and its total heat demand. Customers can find more information on the RHI scheme on our ‘Renewable Incentives‘ page. Homes and businesses switching to a ground source system will slash their carbon footprint. Ground source heat pumps replace heat demand from harmful fossil fuels with clean energy from the ground. The result is a sizeable decrease in the amount of carbon an individual or business is directly responsible for. GreenGenUK estimates that a ground source installation will reduce carbon emissions by as much as 10 tonnes a year. GreenGenUK has been providing heat pump solutions throughout the South West since 2011. As such, we have a vast amount of experience designing, sizing and installing heat pump solutions. The first step, and arguably the most important, is to undertake a heat loss calculation. A heat loss calculation is the result of a site survey or analysis of a set of building plans. The calculation assesses a property’s heat demand and heat losses in order for a ground source system to be correctly and accurately sized. This step is pivotal in ensuring an installation that is cost-effective to run and that can meet heating demand. Whether you have a new build or retrofit project, we’re happy to help. Call us on 0800 093 3299 or complete the survey form below to book your survey or receive a quotation based on your plans. We have a page specifically designed to show anyone interested in a ground source installation the potential benefits based on our recent pricing. Visit our ‘Example Ground Source Installation‘ for a breakdown of the benefits.